Country and bluegrass hero Little Jimmy Dickens was a true American icon, but he was a West Virginian first. So when the West Virginia Music Hall of Fame contacted other HoF inductees and noted Mountain State musicians about recording a tribute to the “little but proud” hillbilly hero, they enthusiastically joined the project. 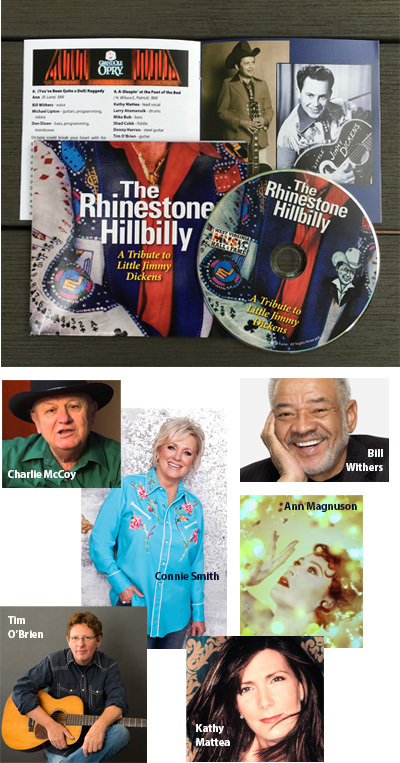 The compelling result: The Rhinestone Hillbilly, a 16-song album complete with a 12-page booklet. “Growing up in West Virginia in the ’30s and ’40s meant you were living what you heard from Little Jimmy Dickens,” says three-time Grammy winner Bill Withers who chose Dickens’ chestnut “(You’ve Been Quite a Doll) Raggedy Ann” for his contribution to the album, Withers’s first new recording in decades. “‘Sleeping at the foot of the bed’ was a reality for a lot of us. Your sister had a ‘Raggedy Ann’ doll. And ‘Bird of Paradise’ was almost a quote from your favorite uncle, if his feelings got hurt!” And renowned singer/multi-instrumentalist Tim O’Brien remembers how he’d listen to Dickens’s Grand Ole Opry performances from his parents’ coal camp radio as a child. Other music luminaries joining Withers and O’Brien on the album include a who’s who of country and Americana performers, featuring Kathy Mattea, Charlie McCoy, Connie Smith, Russ Hicks, Landau Eugene Murphy, Jr., Mollie O’Brien, James Price and Larry Groce, as well as musician-actress-artist Ann Magnuson and others. The man they all honor on The Rhinestone Hillbilly was there at the early years of country music. Little Jimmy Dickens played with West Virginia supergroup The Happy Valley Folks, in which he was billed as “The Singing Midget.” Along the way, he dipped his toe quite convincingly into rockabilly, pioneered the use of twin guitar hold lines and was known around the globe for his incredible cache of novelty songs. But most of all, he was a pure singer, the first country music artist to tour the world, a tuneful ambassador of the rural Appalachian experience. Rhinestone Hillbilly mirrors the broad influence and respect that Little Jimmy Dickens’s music commands until this day. Order your copy today! $15, plus $2 for postage/handling. You can also hear samples of the album, as well as purchase the CD or high-resolution digital downloads, at the project’s Bandcamp page.